A great make-ahead side dish to serve with your roast dinner. This creamy carrot and parsnip gratin, cooked with rosemary, garlic and bay, is a real crowd-pleaser. Heat the oven to 200°C/180°C fan/gas 6. Melt 25g butter until foaming in a large, deep frying pan. Add the onion and a pinch of fine salt. Soften gently for 10 minutes, stirring. Add the parsnips, carrots, garlic, bay leaves and 2 rosemary sprigs, then stir to combine. Pour over the milk and simmer for 10-15 minutes. Remove from the heat and cool slightly. Stir in the mascarpone and 100g of the grated cheese, then season. Transfer to the baking dish. Toast the hazelnuts on a small baking tray in the oven for 5-6 minutes. Remove and roughly chop. Finely chop the leaves from the remaining rosemary sprig. Melt the remaining butter in a pan and heat until foaming. Fry the breadcrumbs and chopped rosemary for 3-4 minutes until golden and crisp. Take off the heat, leave to cool, then stir in the hazelnuts and remaining grated cheese. Season, sprinkle over the gratin (see The Prep), then bake for 35-40 minutes until golden. 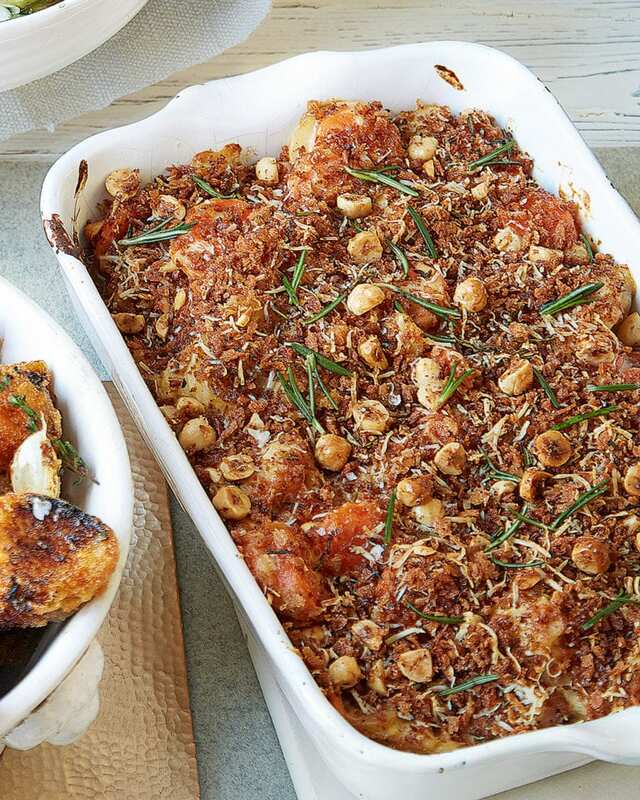 Assemble the gratin, then cover and chill the day before. Remove from the fridge 1 hour before baking.